As Starters, these five NFL stand-outs will be prominently featured in the single player version of the game and throughout the website. Each Starter will have a key role on one of the Head Coach teams this season, including teams led by Bill Cowher, Brian Billick, Jimmy Johnson, Dan Reeves and Tom Landry. Fans will see, for example, the incomparable Ray Lewis reunited under the expert leadership of Coach Billick, and get a chance to experience his bone-crushing tackles first-hand in a free-to-play, online football game. "Our 2009 Starters are some of the premier players in the NFL and give even more authenticity to Quick Hit Football," said Jeffrey Anderson, founder and CEO of Quick Hit. "We're excited to offer fans the chance to play against these elite players -- whether it's trying to stop Umenyiora's pass rush or Westbrook's power sweep." have back-to-back 400-yard passing games. PD, and 14 fumble recoveries in his career. forced fumbles and 8 fumble recoveries. receiving yards or a better yard per touch average. 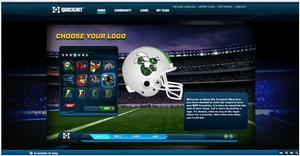 Quick Hit Football is a free, authentic football coaching game that doesn't require a credit card or massive download. Unlike twitch-style games, Quick Hit Football offers a persistent season that lets fans build a football dynasty by earning fantasy points with every game. Fans turn their rookies into professionals, improving their rank, and boosting their players' levels in a quest to become the top-ranked Coach of the virtual gridiron. Headquartered in the shadow of the world-famous Gillette Stadium in Foxboro, Massachusetts, Quick Hit, Inc. is developing premium, free-to-play, online sports games and entertainment for a global audience. Quick Hit's products fill a massive void in the sports industry by offering head-to-head competitions that combine a rich graphical environment, the accessibility of Adobe® Flash®, and the wide appeal of fantasy sports. Its first title, Quick Hit Football(TM), is scheduled to be released during the 2009 football season. For more information, visit www.quickhit.com. QUICKHIT, the Quick Hit logo and Quick Hit Football are trademarks or registered trademarks of Quick Hit, Inc. in the U.S. and/or other jurisdictions. Adobe and Flash are either registered trademarks or trademarks of Adobe Systems Incorporated in the U.S. and/or other countries. All other trademarks are the property of their respective owners. Quick Hit and Quick Hit Football are not affiliated with, endorsed or licensed by the National Football League or the National Football League Players Association in any way.